i'm working on my own qOrbiter skin. Currently i'm playing with Photoshop get the basic design. i like it so far. show me moar!! 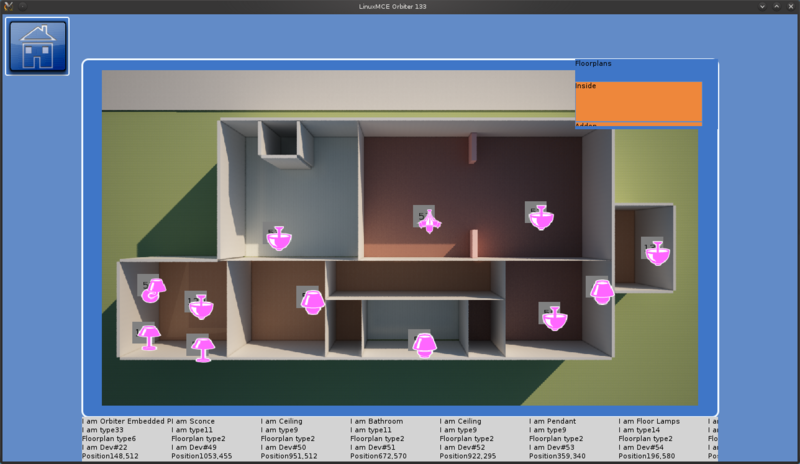 Looking very nice, i am curious on how you want to do the floor plans, media navigation and media file grids. And i'm also very interested to see how the floor plans will evolve. It's a nice design, the only thing I may suggest, is that the icons be drawn by the same artist, so as to have consistency. The icon images do not look consistent, different lighting, styling, etc. Consistency is _exceedingly_ important, and makes the difference between a good design, and an exceptional one. Yes I agree. e.g. imho the telephony icon really jumps out. Except the climate icon, its one icon set! @tschak909, you are right, good consistent icons are the base of a good design. Icons will be the main issue on that design. So I guessed the wrong one. Still I think the telephone is too much. yeah because my current one is fugleeeeeee! i have to rethink the menu. i missed the function to open the floorplan. Floorplan in Orbiter is used by clicking on the main icon. Double clicking is no option for qOrbiter.